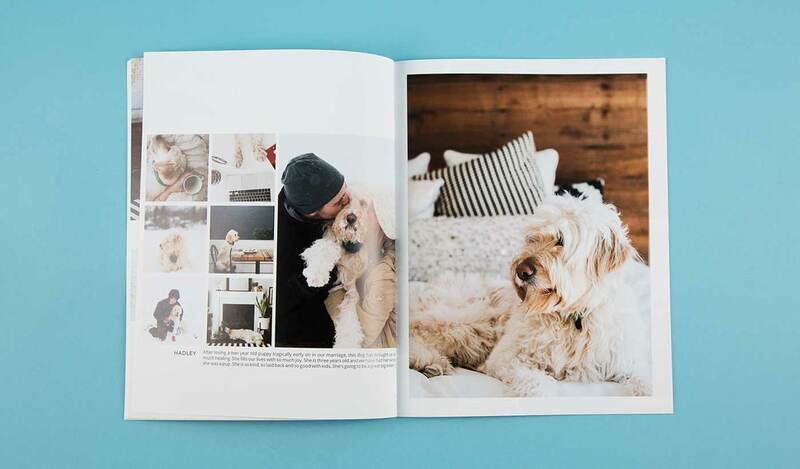 If you are a frequent reader of our blog you know our Author Spotlights highlight authors of all types of books: from quarterly magazines and Kickstarted children’s stories, to shelter dogs and online dating. This time, we focus on another category of book creation—profile books. Typically used for couples looking to adopt, profile books are a way for expectant mothers to choose a family for their child. Enter Hannah and Josh Eloge. Hannah and Josh live in Chicago, Illinois where Hannah works as a Creative Director for a global orphan care organization called Children’s HopeChest and Josh is currently in his second year of medical school at Rush Medical College. When they aren’t playing around with their Goldendoodle, Hadley, they check out restaurants around the city and spend their Friday nights working at a warming center that provides a warm meal to people experiencing homelessness. Hannah was gracious enough to sit down with us and share a little more about herself and their domestic adoption story. My idea of happiness is simple, being around those I love most. I have the best family, a loving husband and the most supportive friends. I am very lucky to have these people with whom I can “do life”. I love being gathered around a table with those I love most. There is something so life-giving about feasting together—sharing food and stories around a table, whether trying a new breakfast place in Chicago with friends or gathering around the table with my family in Tucson, Arizona or Josh’s family in South Dakota. Some of my favorite moments are the most simple in life. I feel a different kind of happiness when I travel. This past summer Josh and I returned from our first trip to Europe. We loved not having an agenda, spending the day exploring (especially in Iceland!). Meeting new people, getting to know a new culture brings me great happiness. One of my favorite places to visit is Africa. I have traveled to Africa a few times for my job as Creative Director for a global orphan care organization. And although I love every country I have visited in Africa, Zambia has won my heart. There is something about the smell, the red dirt, the people, the sound of their songs—it just makes me feel completely alive and that I am right where I should be. In this season of adopting, I am so thankful that we have friends and a great community surrounding us. We have/had to raise a ton of money to bring a little one into our little family, and our friends and families have shown up in BIG ways—from just checking in on us, to inviting us to dinner because they know money is tight, to the mind-blowing donations they have contributed to our adoption fundraiser. We are just so grateful. My husband and I have always wanted to adopt. When we were dating, I asked Josh if he would be willing to either move to Africa someday or adopt. He was all in. After five years of marriage, we decided it was time to start out family and there wasn’t much question that we would grow our family through adoption. Adoption was always our Plan A. What did surprise us was that we decided to go with domestic adoption. We always pictured that we would adopt internationally but when we decided to start the process, we both felt a new tug towards domestic adoption. My husband is in medical school and domestic adoption just made more sense with where we are in our lives. A huge reason we chose domestic adoption is because we wanted an open adoption, we wanted a relationship with our son or daughter’s birth mom to the extent that she feels comfortable. We believe that life isn’t always black and white, and that in the gray and the messiness of life is where transformation happens and life is truly lived out. So, we aren’t sure what that relationship with the birth mother will look like, but we are excited to see how this story unfolds. We have finished the home study portion of the adoption (all the hours of paperwork and fingerprints and meetings with our social worker) and now we are what they call a “waiting family”. We could get matched any day with an expectant mom! 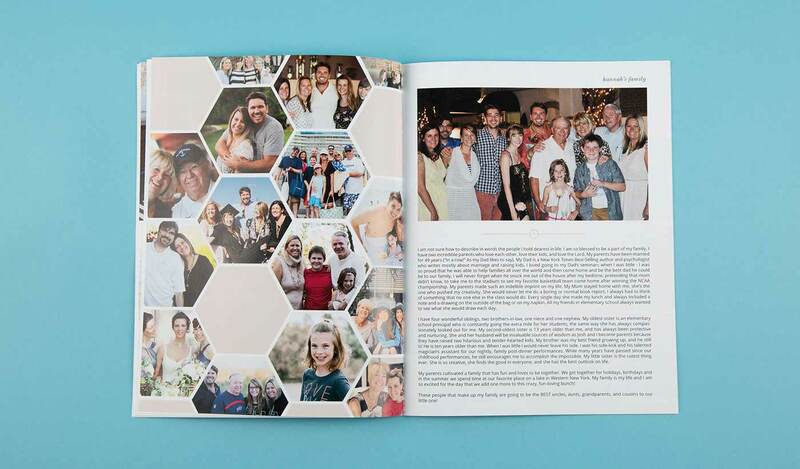 When you are adopting domestically, you are required to create a Profile Book or a Look Book. This is the book that expectant mothers look through to decide who will raise their baby! This is such an important part of the process. I can’t believe that an expectant mom only has this book to use to make her decision. No pressure, right?! I was so excited to start our book. I have always loved photography and have dabbled in graphic design. I started this book as soon as I knew we were adopting. We poured over every word and picture. We wanted this book to be a true expression of who we are and what we were all about. In the beginning, I made the mistake of googling what you should or shouldn’t say in your Profile Book, many articles said not to say you like to travel, some said to not have posed or “too pretty” photos. I was going crazy listening to all the “rules”. At some point, I threw most of the “rules” out and made it what I thought it should be, what represented us, including our love to travel and plenty of pretty photos! We share about our families, how we met, our winsome goldendoodle, our church and community, and our home. Why did you choose to make your book using Blurb? I am so glad that I went with Blurb to create our Adoption Profile Book. I loved that they had an InDesign template that I could use because I knew I wanted to create my own spreads for our book. You have to print so many copies of your profile book during the adoption process. Sometimes as many as 50-75 copies. So affordability is HUGE for us! What I loved about the Blurb magazine was that it was affordable, but it was also high quality. I loved the paper, and the cover was much sturdier than I expected. I told all my adopting friends to use Blurb! If you want to learn more about Hannah and James’ adoption story, check out their blog. Want to learn more about magazine printing options? Take a look at our magazine offerings.